The revolutionary new game that turns words (and your brain) inside out. 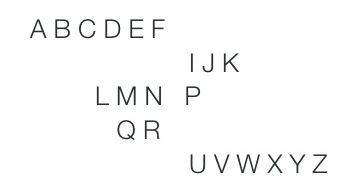 The puzzle consists of two elements – “spiral text”, which is the letters you see (as in the alphabet above) and is a word or phrase that, read left to right, top to bottom spirals around the “spine text”; but some letters are missing. The spine text is the missing letters which make up a word or phrase that slots in vertically from top to bottom and makes sense of the spiral text. You can add letters to the spine text using the disclosure button at top right, which displays the number of missing letters. You lose a point for each time you use a disclosure. 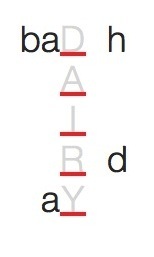 Enter letters in the spine by tapping to the right of the space (A-Z) or left (Z-A). Tapping on the space itself is random! Your score for each puzzle is the number of disclosures you have left on completion. The ketsudo seal will appear on completion and the puzzle will be locked. It can be unlocked for others to play. Unlocking will not affect your initial score. Play against others – the highest score on each puzzle wins. If two or more have the same score the person who finished first wins. There is no time limit. Or play against the world on Twitter, from the Twitter page. Daily topical or themed puzzles will be tweeted; just reply to the tweet with the answer. The first correct answer wins and will be retweeted. Occasionally hints will also be tweeted. You can also interact with the creators of ketsudo on Twitter. The home page is where you can choose your puzzle set to play (just tap on the set you want to play); it will tell you how many puzzles you have solved in each set and what percentage of disclosures you have left (your “set score”). More puzzle sets at different playing levels can be purchased on the shopping page. On the purchase of more sets the app will be ad-free. Settings for the app can be changed on the settings page. The spine letters are always in upper case, the spiral letters always lower case. The solutions may or may not have a relationship to the spiral text. Sometimes the puzzles may give a hint, especially if the solution is a proper name. The natural spacing of the words may not always be observed. Words and phrases are treated as “found objects” – just material for the puzzle. For example, the spiral text “raining cats and dogs” may be written as rainingcats anddogs. However, the solution, if more than one word, will always obey natural spacing. The solution will always be logical, even if the spiral text isn’t. Here is a puzzle with a phrase for the spiral text, where the natural spacing is obeyed. Here’s an example with unnatural spacing of the spiral text and two words for the solution. 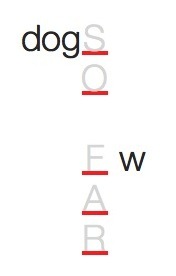 Occasionally a “/” will precede a missing letter to signify a new word in the spiral text, but only in rare cases. New words may simply be signified by being on a new line. As far as possible solutions will not be roots e.g. solitude will not give SOLE, but might give SLIDE. Some puzzles are very simple and some very difficult and they are sorted into sets of 100 puzzles – (e)asy (m)oderate, and (d)ifficult. Navigation through the puzzles is either by swiping, or using the puzzle number at top left which will fast forward/back if you keep your finger on the arrows.